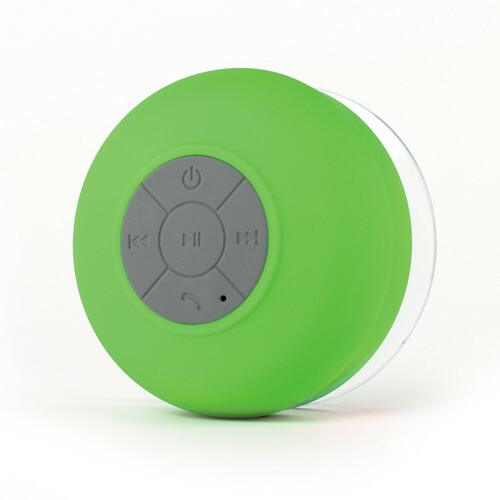 The green Splash Shower Tunes Bluetooth Waterproof Shower Speaker from FRESHeTECH is a waterproof Bluetooth speaker that allows you to listen to music while in the shower, washing your car, sitting by the pool, or anywhere you'd be worried about getting a traditional speaker system wet. Buttons on the speaker let you play/pause music, skip songs, and adjust the volume. The speaker also has a built-in microphone that allows you to make speakerphone calls from your mobile device. The speaker has a suction cup that sticks to nearly any flat surface so you can keep it close. Box Dimensions (LxWxH) 4.252 x 3.543 x 3.465"
Splash Shower Tunes Bluetooth Waterproof Shower Speaker (Green) is rated 4.3 out of 5 by 16. Rated 5 out of 5 by Anonymous from Great Works great, sticks to shower wall, doesn't fall (as long as I used water on the suction cup first), full charge lasts 3-4 days, easily play/pause, next, previous, volume up, and volume down. Works with youtube, iheart, and phones music player. By works I mean that not only does it play, but on iheart and youtube if you hit next, it'll go to the next song/station. Bought it as a gift for the wife. Only complaint about this thing is she plays it too lound in the shower. Also, another complaint I just thought of. When trying to turn down the lights and get a relaxing bath/shower, there is a blue blinky light that is annoying. Rated 1 out of 5 by dpm193 from BATTERY WILL NOT HOLD CHARGE... HORRIBLE PRODUCT Same thing as the other 1-star review... I've had this speaker for about 7 months. It got used very little- MAYBE twice a month in my shower! Will work when plugged in, but dies the moment it is unplugged. Batter does not hold a charge whatsoever. B&H says this product has a 30-day warranty. The previous review says it has a 15-day warranty. Regardless of whether it's 15 or 30 days, this is a very short warranty period. The manufacturer clearly knew what they were doing in making product that works just a bit past their warranty period and not much longer. This is garbage and I would NOT recommend buying a FRESHeTECH product. I am Very unhappy about this purchase. Rated 1 out of 5 by Kevin_S from Battery does not last Worked great for 4 months, but the battery will no longer keep a charge. I didn't expect it to last forever, but the FreshTech website states they have a 15 day warranty. I have never seen such a short warranty period. Rated 5 out of 5 by Christy the kid! from Great blue music ball! Great to use in the shower or bathroom with your I-pod or some other Bluetooth device! It's nice to listen to music while your getting ready to go!! No true fault's!! Rated 5 out of 5 by Tina K from Great product! Speaker works great! Easy to use! Can even use sir to text while in the shower!!! My daughter loves it, I ordered another as a Christmas gift. Rated 5 out of 5 by UD from Easy to use & Portable Sound isn't what you would expect from a Hifi System, but works great. Ability to answer calls is a plus. Rated 4 out of 5 by Anonymous from Great speaker for the shower Easy to use, and good sound for the shower. It lasts around a week between charges, which is great. This speaker is typically used for about 45 mins to an hour each day. So the charge lasts about 2 weeks. Based on usage, it does seem to last for about the 11 hours it states on the packaging. Why is the blue one cheaper than the other colors? It says its only $29 not $39. Probably because the other colors ar mire popular. I bought that one because my bathroom is blue. The power button only blinks blue and won't pair or reset. How do you fix this?? If you are still having issues with this, please contact us at cs@&lt;a href= http://bandh.com, target= _blank &gt;bandh.com,&lt;/a&gt; or give us a call at 800.606.6969 / 212.444.6615. I couldn't find a volume control on the speaker itself, but I find the volume control buttons on your actual phone should work. Can it connect it FM radio? The primary music source uses Bluetooth to connect to the speaker. Not sure how your FM feed is broadcasting but if Bluetooth is involved it should work. If it's not via Bluetooth, it won't. It should be the topmost button. Press and hold until it makes a sound to turn it on. How do you know when its off or on ? It blinks every 5 seconds or so when it's on.